We love our music. And our portable devices, such as cell phones or MP3 players, make it easy to take our music on the go. These portable players do an ok job powering headphones. The nicer the headphones, the better the sound. And to really make these nicer headphones sing, extra power really helps. Enter the Creative E5 Headphone Amp. The Creative E5 Headphone Amp came in a nice looking printed box with photos of the product and its specs and features. Included with it were the owner's manual, wall plug, USB charging cable, and optical cable. Materials used in the construction was mostly plastic with some metal. The quality of materials used were very good, as was the quality of construction and fit and finish. It felt well made in hand. As you can see form the features and specs, the Creative E5 is more than just a headphone amp. Creative has an excellent reputation in the computer components industry for their sound cards. Creative has tapped into this expertise and included the SB-Axx1 sound processor chip. This processing chip delivers quite the sonic punch. Creative could have stopped there and have a great product. Instead, they made a great product better by adding Bluetooth. This turned the Creative E5 into a wireless product. So now you have a lot of options. Looking for a great headphone amp? Check . Don’t need a headphone amp, but instead looking for a wireless product that has excellent sound processing? Check. The Creative E5 will do it all. I love the fact that the Creative E5 is designed for the audiophile. Using top of the line Cirrus Logic CS4398 DAC, it can handle 24 bit/192 kHz resolution with a high 120 db SNR. So whether it’s standard mp3 or high resolution audio, the Creative E5 is ready for anything. With the Cirrus Logic CS5361 ADC, it’s also ready for high quality recording with it’s built-in dual microphones for stereo recording to your smartphone or tablet. And the built-in crystal Voice provides a suite of audio recording DSP enhancements. SBX Pro Studio adds realism to your games and movies. The Bluetooth 4.1 uses aptX, AAC, and SBC for quality wireless connections. The Texas Instruments T16120A2 headphone amp provider ultra low distortion, handles impedance from 2.2 to 600 Ohm. It can also power two pairs of headphones simultaneously, and is designed to work seamlessly with both Android and iOS. All of this looks great on paper, but how does it sound? With as many features as the Creative E5 has, I must admit, I had high expectations. I am glad to say, I am not disappointed. For a lower ohm rated pair, I tried them out with a pair of German Maetro GMP 435 S. They are efficient to drive with just an iPad or cellphone, as most headphones are. But having the extra power did open them up. When talking about amplifier power, I like to use the analogy of horsepower and torque. You can have a lot of horsepower, but if you’ve got a big, heavy load, that’s where having a lot of torque is what is important. It can be similar with amplifiers. Having that extra power can really help to drive the speakers. Listening with the Creative E5, it delivered just as it was intended. Honestly, there was not a huge difference. But my German Maestro’s did sound cleaner, richer, and fuller. The drivers were able to open up with the extra power. And I could tell there was plenty in reserve, like having a lot of torque for when it’s needed. I was also glad to hear that they were very transparent as well. When not using the powerful audio chip to have fun with some DSP, the music sounded like the recording I am used to hearing, only a bit more aural bliss! As previously mentioned, the Creative E5 has more features than just a headphone amp. The Bluetooth functionality worked very well! It worked much better than expected actually. Most Bluetooth devices have a range of 20-30 feet. This range is also affected by obstructions or walls. With a straight line of sight, I actually got about 40 feet. And walls didn’t seem to affect it. I had my cell phone linked with the Creative E5, with it being in my bedroom upstairs. I was able to walk around all over the upstairs with no problems. I was even able to walk around most of the downstairs as well with no problems! The built-in audio processor proved to also work well too: I was able to easily download the app on my cell phone. Once my cellphone was linked to the Creative E5, I was able to open up the app. The app was divided into two sections. The first was DSP, the second was a 10 band equalizer. The DSP had fun effects to select from, such as surround, 3D, and bass, to name a few. And for each effect you can change the amount of the effect. The 10 band EQ allowed you to change the level of each band for a custom setting. There was also a multitude of preset settings, such as Rock, Pop, Jazz, Classical, etc. I was glad to hear the amp was fairly transparent. But playing with the EQ and DSP also proved to be fun as well. Creative set out to design a great headphone amp with a lot of functionality. With the Creative E5, they hit the ball out of the park! For the audio purist, they provide the extra juice your headphones could be craving. For those that like to play with the EQ and DSP, Creative has you covered there. And of course, the extra functionality such as Bluetooth and built in mics for hands free use is just icing on the cake. 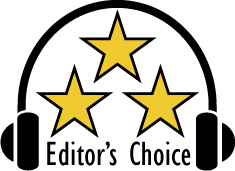 Based on it’s design, features, quality, and performance, the Creative E5 has eared our Editor’s Choice Award. Kudos to Creative. For more info and complete specs, check out their websites at www.uscreative.com.